The PDC Premier League visits Cardiff this week for night 12 at the Motorpoint Arena on Thursday 23rd April. Michael van Gerwen and Gary Anderson both play twice, and with just four league nights left, both men will be hoping to stake their claims for semi-final places. Mighty Mike lost his unbeaten record last week, but he needs just one win to secure a play-off spot and he’ll have two chances on the night against James Wade and Gary Anderson in a final match showdown. Anderson can’t guarantee a semi-final spot, but if he wins both matches this week he will be all but mathematically through. Last week’s action came from the GE Oil & Gas Arena in Aberdeen, and there were some surprise results, not least of which was Raymond van Barneveld’s win over Michael van Gerwen to bring to an end his ten-game unbeaten run. We tipped both Dutchmen for the Premier League at the start of the season, and after Barney’s recent return to form, suddenly the each-way punt on him retaining his Premier League crown doesn’t look as dead and buried as it did a few weeks ago. The first match of the night saw Phil Taylor storm back to form himself, with a 7-3 win over Premier League revelation Dave Chisnall. Adrian Lewis then quickly disposed of Stephen Bunting in the night’s second match, beating the former Lakeside champion 7-2, before James Wade and Gary Anderson took a point each from a 6-6 draw. That was followed by van Barneveld’s emphatic 7-3 win over van Gerwen, before Phil Taylor and Stephen Bunting wrapped up the night with a 6-6 draw. With just four league nights to go until the semi-finals and final at the O2, it’s the business end of the season and there’s little room for error any more. The league table is so tight that, according to Phil Taylor, “…it’s given us all a kick up the backside, which doesn’t do you any harm”. With that in mind, it’s time for the big players to step up to the mark, and we fancy The Power to take points this week, along with van Gerwen and Anderson, as the three top players in the world press for play-off places. Stephen Bunting played two games last week, but he didn’t take advantage and came away with just a point after losing to Adrian Lewis and drawing with Phil Taylor. That’s left him rock-bottom of the Premier League with just 8 points, and realistically, a semi-final berth is well beyond his reach now. The opposite is true of Gary Anderson, who has a play-off berth well within his grasp. He’s third in the table with 14 points, and believes he needs another two to four points to be safe in the top four, and a couple of wins tonight would be perfect for him. That may not be possible as his second match is against van Gerwen, but he can be backed to get the win against Bunting in the opener to take the pressure off that final match. 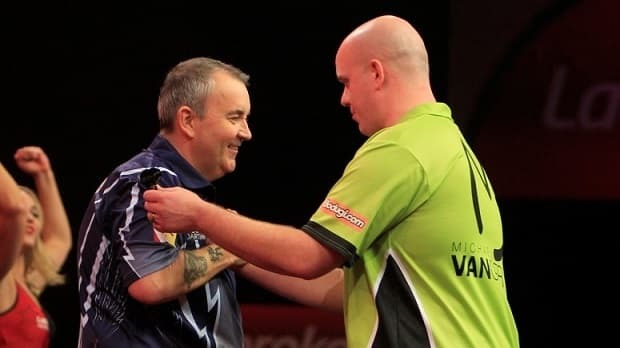 Michael van Gerwen lost his ten-match unbeaten Premier League streak last week, when he was defeated by an inspired performance from fellow Dutchman Raymond van Barneveld. Mighty Mike admitted afterwards he hadn’t been at his best, but he can console himself with the fact that he’s still top of the league with 18 points, and needs just one win from his two games tonight to secure a semi-final spot. Like most champions, van Gerwen can be dangerous after defeat, and the very best sportsmen are the ones who show a reaction after a loss. He could be a ‘wounded animal’ this week, and that doesn’t bode well for his opponents. James Wade earned a creditable draw with Gary Anderson last week, but his failure to take advantage of his double-game night the previous week has probably put paid to his chances of reaching the semi’s. He was beaten twice by Adrian Lewis and Dave Chisnall in his double-header, and it’s hard to fancy him getting anything from van Gerwen. The Dutchman ran out 7-4 winner when they met first time around in the Premier League on the 2nd of April, and little has changed in the last few weeks to suggest there will be a different result this time. The two players from Stoke face off in the penultimate match of the night, and it promises to be a cracker. Taylor bounced back to form last week with 7-3 victory over Dave Chisnall, inflicting just a third defeat of the season on Chizzy. Lewis has also been in better form lately, having won his last three games against Stephen Bunting, James Wade and Peter Wright. With all due respect to those players though, none are in the league of Phil Taylor in top form – in fact very few players are – and he is worth backing at odds a shade over evens. The two last met in the Premier League in February, when Taylor ran out 7-2 winner. With his inconsistent form of previous weeks we’d have been reluctant to back The Power, but hopefully last week is a sign that he’s back to his best, and if he is, he should win this match.